I wrote about this excellent institution at some length last year, so this time I’ll be brief and share a few photos. Yesterday evening, London Historians’ 15 month wait for our visit came to an end and 20 of us piled up to the fourth floor of a nondescript building located next to a gym near Tottenham Court Road. Because of the very nature of the Government Art Collection’s business, you’ll always see different art if you go a second time, as I discovered. 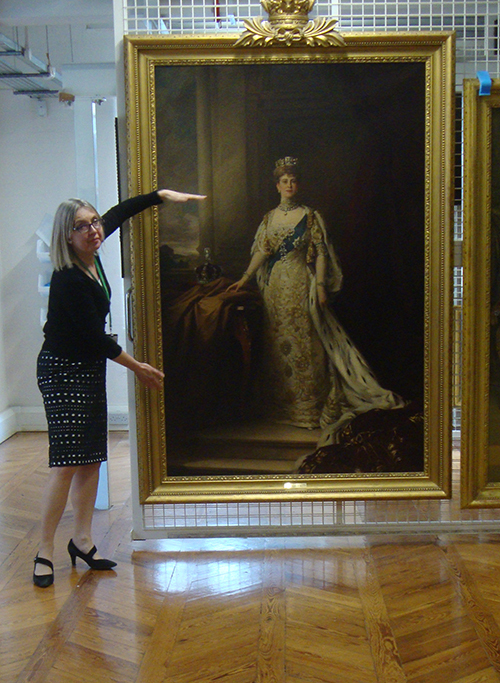 We were particularly lucky because their recent outreach show, which took the very best of the collection to Birmingham and Belfast had just returned to HQ, so we had glimpses of fine art which usually grace the walls of our embassies and missions in cities far away. Hence we saw a very large portrait of Elizabeth of Bohemia (daughter of James I), which spends most of its life in Prague. 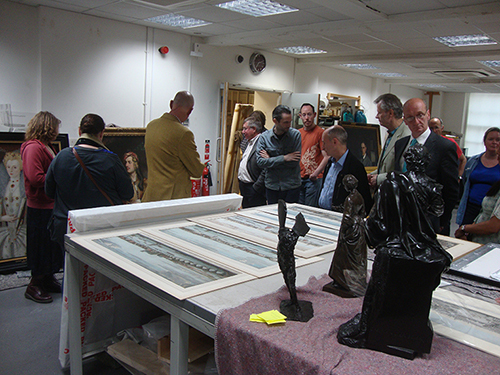 We were treated to several Sickerts and a GAC-commissioned Lowry featuring Buckingham Palace for the coronation. Best treat of all, I think, was the best-known portrait of Lord Byron, which usually lives in Athens (the Greeks adore it, apparently). Checking out Byron. 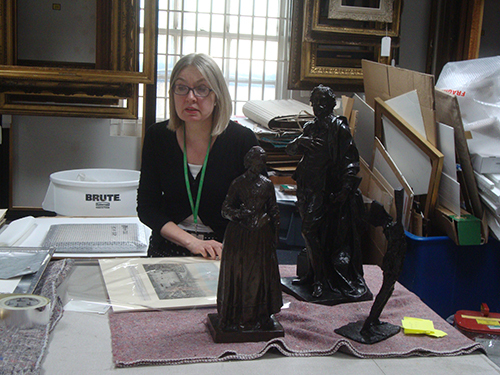 On the bench are Buck panoramas and exquisite statuettes, including one by Elizabeth Frink. 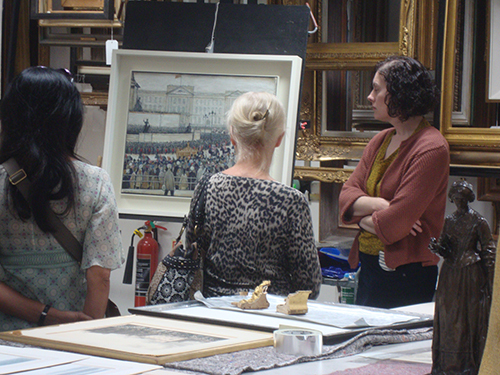 What I particularly enjoy about any behind-the-scenes tour – and this one in particular – is viewing art in storage, in a non-curated environment. The objects seem without their glad rags and you are able better to judge them, somehow. Admiring Lowry. Missing from the current Tate show. Our treat. On behalf or London Historians, my sincere thanks to Clive Marks for organising, but especially to deputy director Julia Toffolo who showed us around: her hospitality, expertise and enthusiasm made it a very special experience for all of us. I shall most definitely organise another visit for 2014. Join us! Government Art Collection web site. Back in the day, Messrs Ferodo, purveyor of brakes and related accessories, concentrated much – probably all – of its sales and marketing budget on painting the company name in large capital letters on the sides of railway bridges. Up and down the land. This went on for years, and was pretty smart when you think about it. 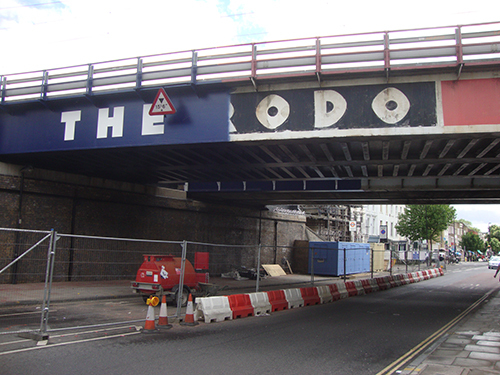 What bridge owner was going to rush out and re-paint the bridge when your advertising lapsed? 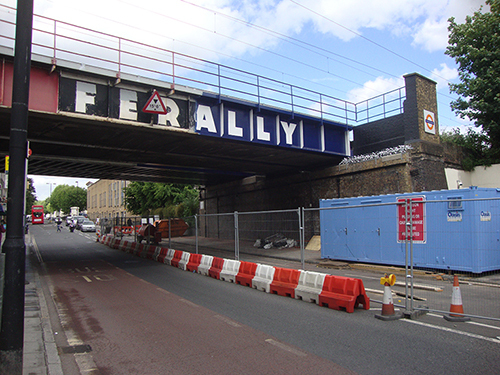 On our Up the Cally walk the other weekend, we spotted this bridge on the Caledonian Road, half way between the new scheme and the old. FERALLY on one side and THEODO the other. 21C streetscape replacing 20th. Update: Per comment below by Rob Smith, I ought to point out that Rob was our guide on this adventure. He is a qualified Clerkenwell & Islington Guide and a Member of the excellent London guides cooperative, Footprints of London. Many of this august body are London Historians members too. Does anything in London appear more incongruous than St Giles’ Cripplegate, an oasis in the brutalist desert of the Barbican? 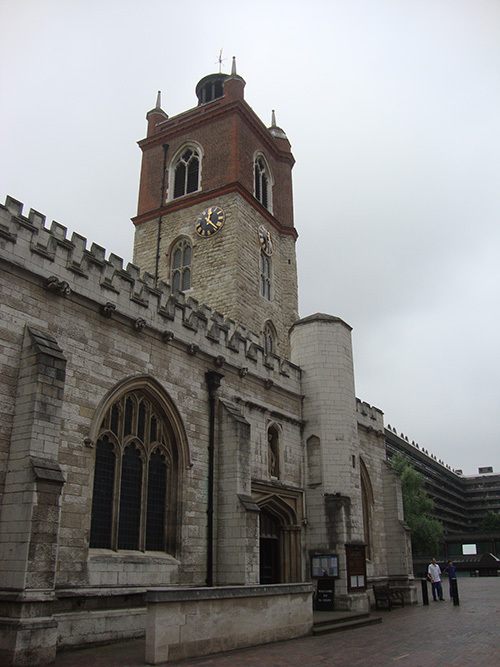 The name derives from the parish of Cripplegate Without, it being outside the ancient wall of London, specifically at Cripplegate, one of the seven gates of the City, torn down with the rest and sold for £91 in the 1760s. After WW2, the building rose again from the rubble of one of the worst-blitzed areas of the capital. There was hardly a brick standing on another once the Luftwaffe had done its work on the district. And yet, though horrendously damaged and burned, the crenellated medieval shell and tower of St Giles’ somehow survived. Not only that, it had escaped the Great Fire also, although it did get badly singed on several other occasions. The church we see today is the post-Blitz restoration largely based on the 1545 plan which survived after just such a fire. This makes it one of London’s oldest standing churches, as A.N.Wilson pointed out with not a little hyperbole, admittedly: “the last imaginable little memorial of that vanished city that Shakespeare knew.” (See here for other examples). Having seen this venerable church from a distance many times, I finally got to make my long overdue first proper visit last week. It did not disappoint. As medieval parish churches go, St Giles’ is very light inside, fortunate indeed given the grim, grey weather of the Summer of 2013. Statues, busts and memorials are plentiful, not surprising given the associations with many household names from history: John Foxe, the martyrs chap, buried; Launcelot Andrewes, editor of the Authorised Version, rector; Oliver Cromwell, married; John Milton, buried; Rick Wakeman, recorded (see below). Milton is definitely the honoured son, though, judging by the sheer weight of Miltoniana around the place, including a full-size statue. Other noteworthy things which chimed with me were portrait busts endowed by a hero of this blog, John Passmore Edwards: Bunyan, Cromwell, Defoe and Milton*. A stained glass window dedicated to Elizabethan actor/impressario Edward Alleyn who was a benefactor of the church and a reminder that the early theatre was banned from the City, hence St Giles’ without Cripplegate. And as a fan of Yes and Rick Wakeman from my early teens, the church organ thing. Most unusually, St Giles’ has three of them. 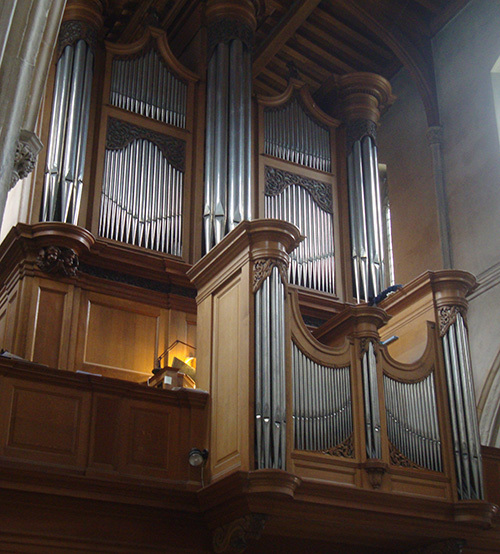 The pipe organ. Looks and sounds beautiful. 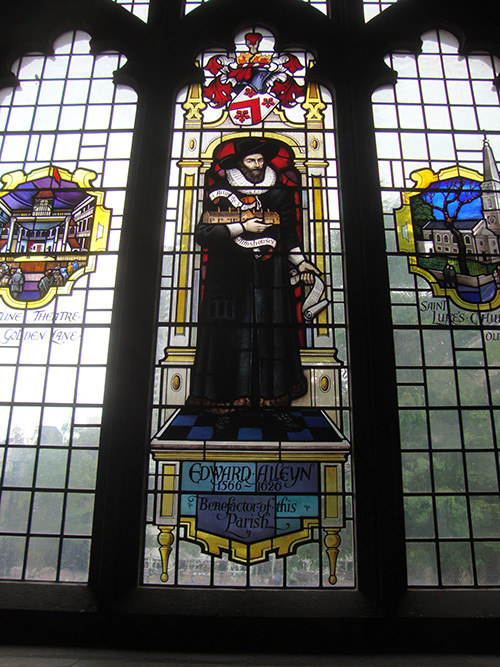 Commemorative window for Edward Alleyn. As a bonus, someone was practising the organ the whole time I was there. 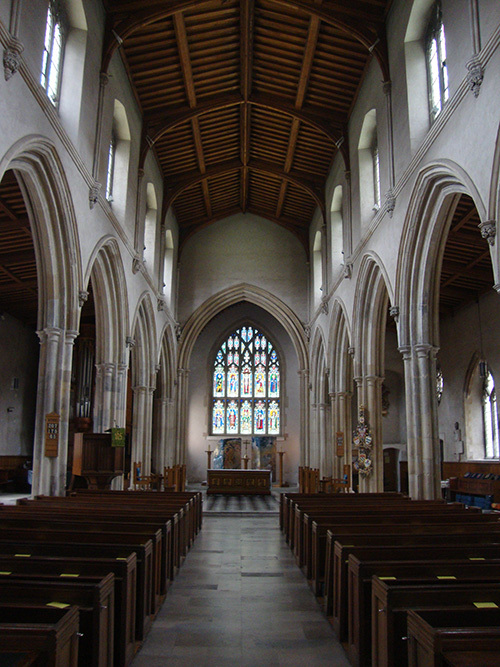 This happens rather often when you wander off the street into one of our great historic churches. So another is added to my collection. It’s wonderful, do go. 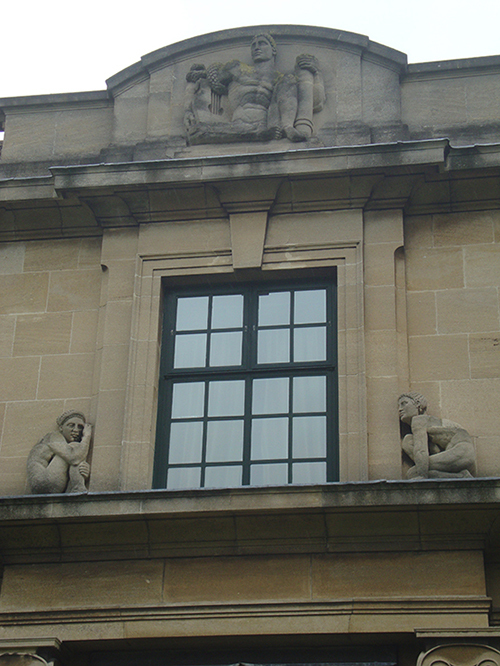 * Passmore Edwards was once approached by the people of Chiswick to finance a portrait bust of local hero William Hogarth for the new town hall. He declined. YouTube: Rick Wakeman talks about his St Giles experience. YouTube: Rick Wakeman’s Jane Seymour, featuring the St Giles Cripplegate organ. 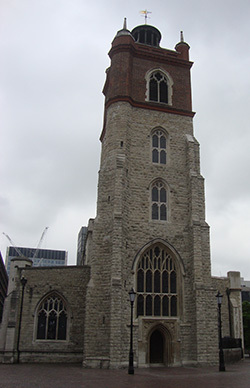 St Giles’ without Cripplegate web site. A Guest Post by LH Member Rob Smith. 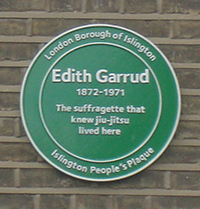 Just off Islington’s Caledonian Road, in Thornhill Square you will find a green plaque commemorating Edith Garrud (1872 – 1971) – a woman known as the Jujitsu Suffragette. Edith and her husband were physical training instructors, a fairly unusual job for a woman in the 1890s. In 1899 they were introduced to Jujitsu by Edward Barton Wright, who had travelled extensively in Japan. Edith excelled at this and was appointed chief instructor at the Jujitsu school in the West End. In 1907 Pathe films were looking for new subjects for action for narrative films and a jujitsu action movie was perfect. Edith starred in “Jujitsu Brings Down the Footpads” which involved a purse thief being chased across various London locations, before Edith delivers her own brand of street justice! 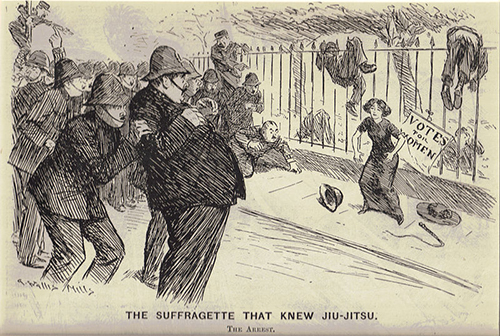 When the suffragettes began their campaign of window breaking they started using the Jujitsu school as a place to rendezvous, with Edith offering an alibi, their hammers hidden away under exercise mats. Violence against suffragette rallies was becoming more common so Edith felt she could help by teaching them self defence. She trained an elite suffragette group called The Bodyguard in secret locations across London. When the police tried to arrest the Pankhursts, The Bodyguard were there. Edith was only 4 ft 11 but seen to have thrown a 13 stone policeman over her shoulder. A Punch cartoon showed a group of policemen cowering away from her. After the success of the votes for women campaign, Edith carried on as a martial arts instructor and lived in Thornhill Square Islington until she died aged 99. She remained defiant during the Blitz saying she wasn’t afraid of bombs and would just go about her business during air raids, waving her fist at Hitler’s planes. When Islington Council decided to honour her with one of its green plaques, it was unveiled by Edith’s great granddaughter, who is a boxer. I think Edith would be pleased her fighting spirit continues. His next walk is “Up and Down The City Road” on 27th June which talks about the hospitals, industry and entertainments that lined the City road during the 18th and 19th century. 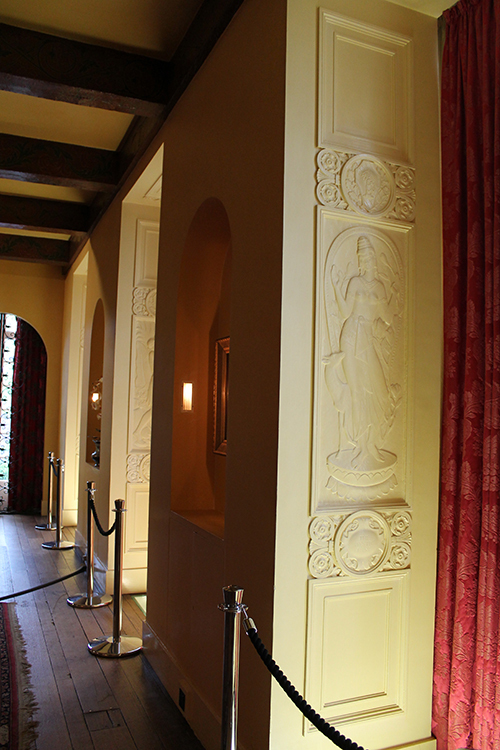 London Historians members can book at concession rate. Information and booking here. Nearly 35 years ago I was a national serviceman in the artillery on a gun position based in the achingly beautiful Eastern Highlands of Rhodesia. We spent Christmas 1977 there, under canvas. The site was in the grounds of a quite fancy mansion named La Rochelle in an area called Penhalonga. What I didn’t know then – and found out only quite recently – was that La Rochelle had been built by Sir Stephen Courtauld in the 1950s and until his death in 1967, was the home he shared with his Italian wife Ginie (Virginia). After the war and a spell living in Scotland, the Courtaulds (who were keen travellers) scoured Africa for an agreeable place to call home, eventually choosing this part of Southern Rhodesia. 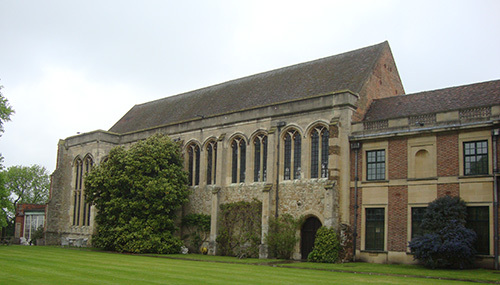 On learning this, I also found out an interesting story that after the Courtaulds’ passing, the people who ran Eltham Palace requested that two Italian paintings at La Rochelle be returned to England. 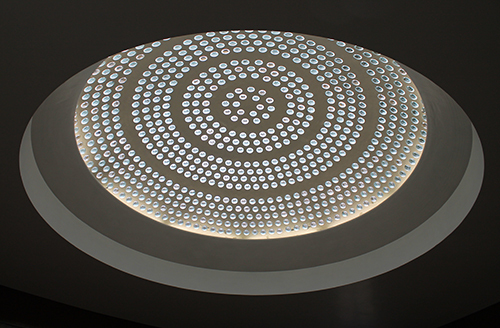 This, naturally led me to Eltham Palace, on the outskirts of London in Kent, but I only managed finally to visit a few weeks ago. It’s run by English Heritage. 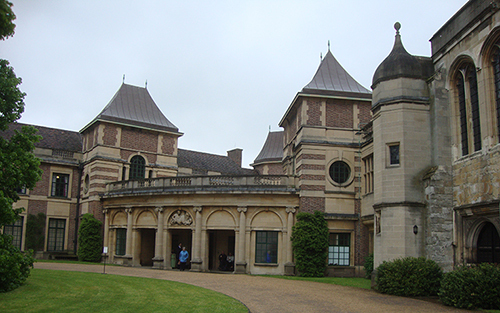 In the 1930s, Stephen Courtauld had built a striking Art Deco country house with all mod cons on the site of the now delapidated and mostly disappeared medieval Eltham Palace. All that remained, in fact, was the old hall, the moat and the bridge. It had been a lengthy decline: John Evelyn was shocked by its condition when visiting in 1676. 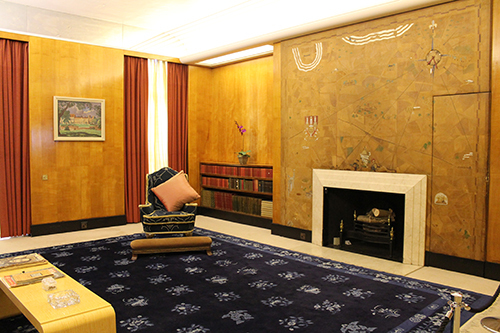 The rejuvenated Eltham remained the Courtaulds home until the end of the war. 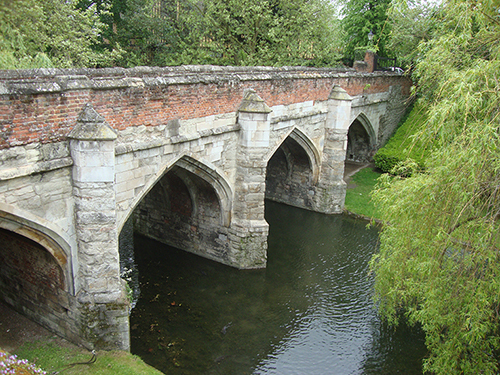 The bridge on the moat. 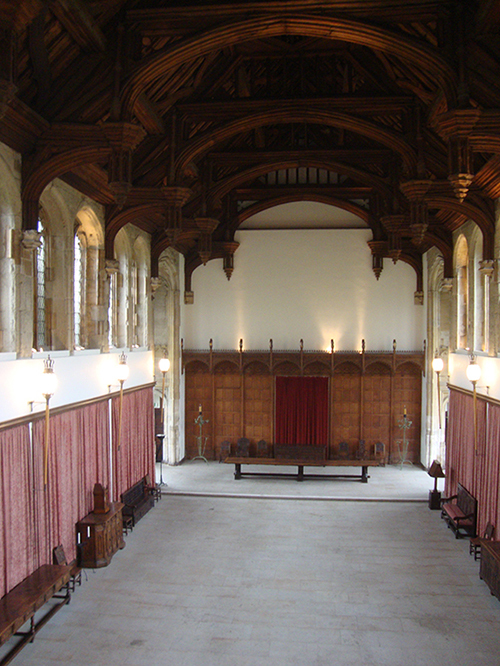 Medieval hall, interior. Who doesn’t love a hammerbeam roof? Strange humanoids. Exterior of the house. So they only lived there for about eight years. But magnificent times, judging by their home cine which are screened at the house. The house was designed by architects John Seely (1899–1963) and Paul Edward Paget (1901–1985) and in-vogue interior designer Peter Malacrida (1889–1980). The building, on two stories, has two wings which flank a large circular hall, so called. It’s more a relaxing and hanging out area. Striking, unusual, light. 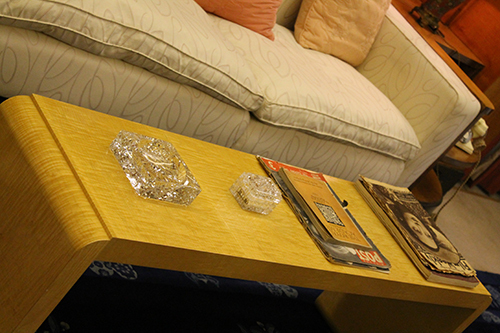 Period Art-deco furnishings and heavily panelled. This is something one can forget about Deco: the wood. There is plenty of the stuff at Eltham. The decor throughout is a delight, regardless of whether you’re into the period. And utterly modern. 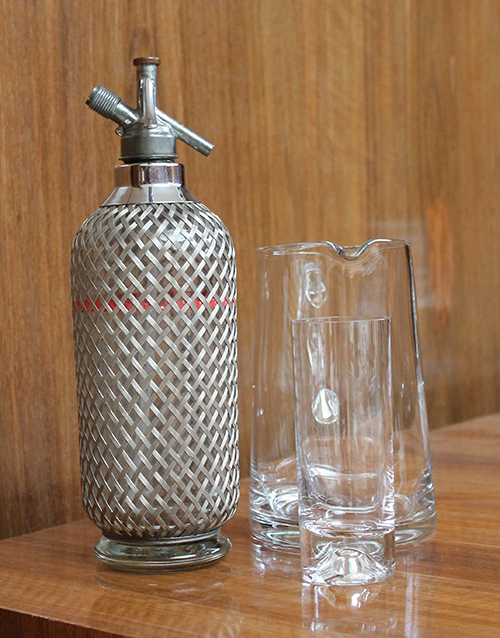 Hot water on tap simultaneously and throughout; electric clocks in all room, 100% synchronised from a single source. 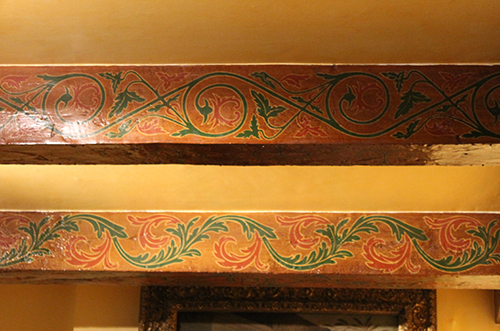 These are vital considerations for exemplary hospitality-givers, and the Courtaulds were this, par excellence – the house was often thronged with an eclectic mix of guests. Stephen Courtauld was the younger brother of the better-known Samuel Courtauld, founder of the eponymous Institute now at Somerset House. They came from a family of Huguenot silversmiths who had diversified into that other Huguenot trade – silk – and made an absolute fortune, embellished in the early 20th Century by diversification into new-fangled rayon. But Stephen’s story is no less remarkable than his older sibling. Having signed up with the Artists Rifles, he served through World War I with the Worcestershire Regiment, at Gallipoli and then on the Western Front, winning the Military Cross. In theatres where the life expectancy of an officer was said to be six weeks, this is an amazing achievement. 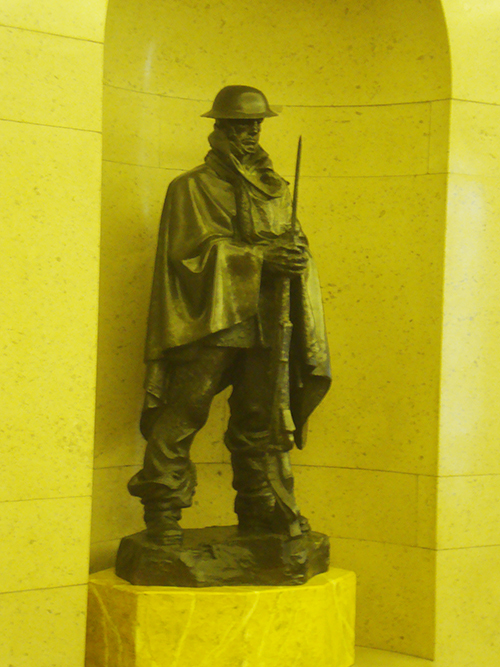 A comrade-in-arms and brother officer from the Worcesters was the realist sculptor Charles Sargeant Jagger, also a former Artists Rifles member. After the war, Stephen became his patron and offered much encouragement. The reminder of this relationship is a beautiful bronze in Courtauld’s study of The Sentry, the full-size statue of which is in Manchester. 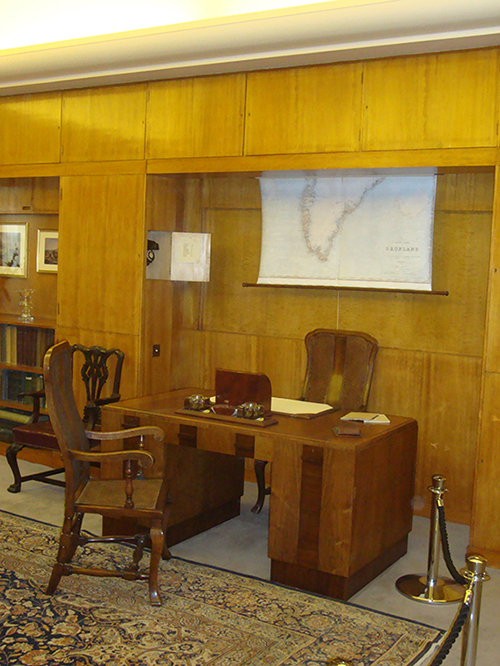 Also in this room are many of Stephen’s books, many of them Empire-related, which in a way point to his final years. 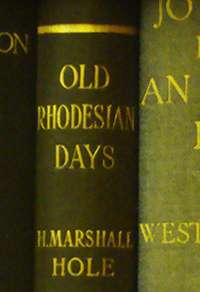 I was tickled to see Old Rhodesian Days, 1928, I must try and get a copy. During peace time, Stephen – like his brother – was a great patron, if somewhat more eclectic. His beneficiaries included the Covent Garden Opera and British film, particularly Ealing Studios: he loved hanging out with movie folk such as Michael Balcon, a frequent guest at Eltham. Even in Rhodesia, from their remote Shangri-La, the Courtaulds were great benefactors, bestowing two concert halls, a theatre and a farming college. Stephen also contributed to University College, Salisbury, now University of Zimbabwe and the Rhodes National Gallery, which I enjoyed visiting as a boy (my father was sniffy!). Stephen received his knighthood in 1958. After his death, Ginie stayed on at La Rochelle for a few years but with civil war on the horizon, left in 1970, and so we come full circle with us being served laced coffee in our sleeping bags by our NCOs on Christmas morning 1977. 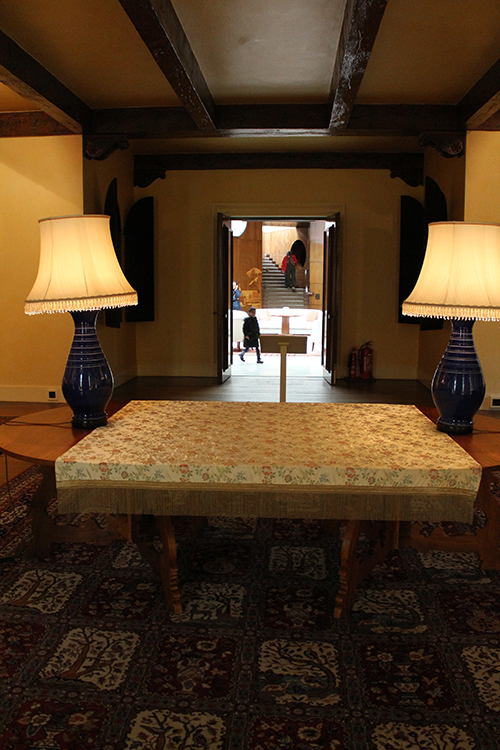 So for me, Eltham Palace was a very personal visit, pulling together many strands. But it is more than worthy of a visit entirely on its own merits, definitely one of my favourite English Heritage sites. 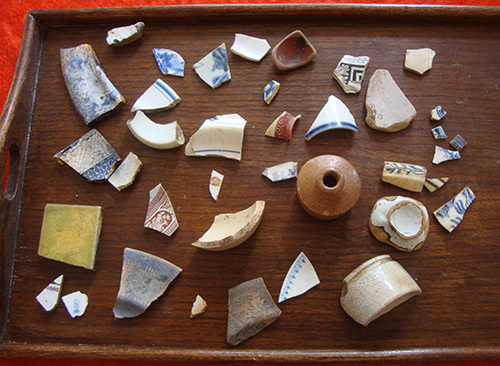 A New Year’s resolution for 2013 was to go mudlarking. A few months ago I tagged along with some folks from the Thames Discovery Programme on the beach at Vauxhall. And loved it, despite the utterly miserable weather. Report here. Yesterday, armed with my brand-new lucky mudlarking wellies, I went down there again, accompanied by fellow LH Member Hannah Renier, who lives locally. And Ed the dog. We mooched around for an hour and half or so. Our haul was amazing in quantity rather than quality and doubtless commonplace to the seasoned mudlark. But we were dead excited. 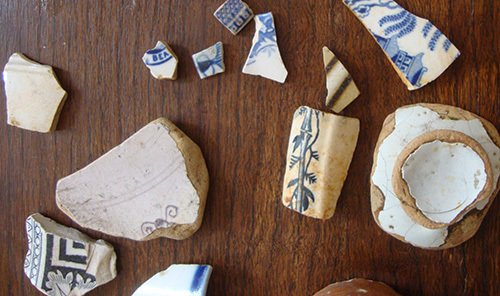 Most of it was crockery. 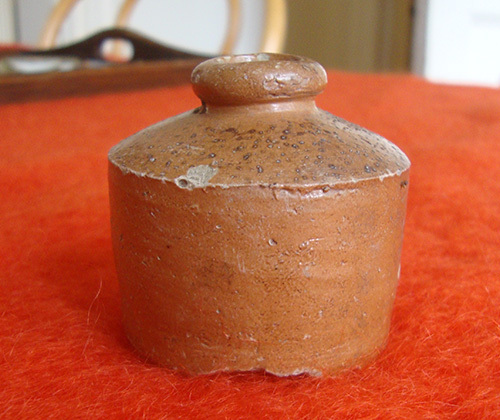 Being newbies at this, with little enough expertise at antiques in any case, we have no idea. But that will come. 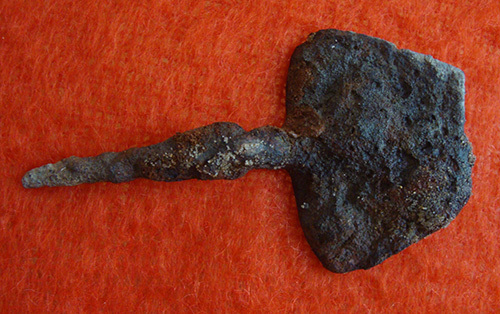 I found an old rusty metal object which appears to be an old bricklayer’s trowel. But find of the day (See, competitive already, just like in Mud Men), was spotted by Hannah. 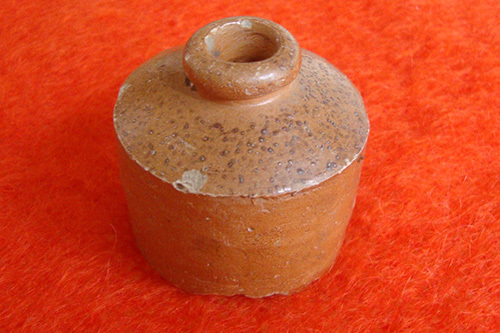 It’s a small glazed earthenware container, an inkwell perhaps. We hope to do more of this, especially if the weather sorts itself out. And I’ll see if I can organise a special London Historians outing with TDP. More anon. There are different Thameses aren’t there? The Thames of Oxford and Henley through Windsor and all the way to Richmond conjures up summer days, pretty girls in frocks, tipsy young men laughing too loudly, stripy blazers and straw boaters. The Thames of Chelsea, Battersea, Westminster and the City is greyer, more business-like, lined with towers and amusements in equal measure; its world-famous bridges and citiscapes, instantly recognisable even by millions who will never visit us. These are the Thameses we all know. 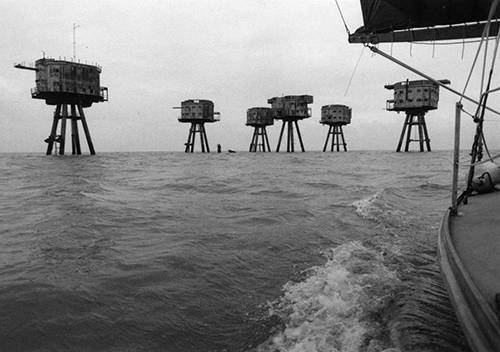 Then, familiar only to those who live in direct proximity – beyond Royal Greenwich and industrial Woolwich and Silvertown – is Thames the Obscure: the estuary. When London was the busiest port in the world, this part of the river was alive with shipping. Today it is populated mainly by gulls and ghosts. But it is celebrated in a highly evocative new exhibition at Museum of London Docklands. Estuary features the work of 12 artists, photographers and film-makers, who follow in the footsteps of Turner and Constable who themselves drew inspiration from the lowest reaches of the Thames, as did Dickens and Conrad. All the works are beautifully and skillfully done but more importantly – thought-provoking: one supposes that is why they have been chosen. Those that appeal most to me are the ones which succeed in emphasising the vastness – the grandeur in a way – of this part of the world. As you enter, you get instant succour from the huge canvasses of Jock McFadyen which deliver real breadth and sense of space. They are quite beautiful. Purfleet from Dracula’s Garden by Jock McFadyen. © Tate Britain. Two other works succeed in the same respect and they are both film installations which take up a whole wall as you sit in the dark and absorb. Each runs for 15 – 20 minutes. The first is the one that’ll appeal most to historians. Thames Film by William Raban is a stew of clips and stills judiciously edited together and with the words of Thomas Pennant from 1787 read by John Hurt. It employs the artist’s own clips of his journey down the Thames, following the route described by Pennant himself. These are intercut with historical clips and photographs mainly from the mid-20th Century. The whole work recalls the estuary’s denizens from days gone by. It is evocative, atmospheric, disturbing. One gets a sense of constant danger. The other big-screen number is Horizon by John Smith. It’s simply a series of fixed-camera clips filmed in and around Margate, then spliced together. 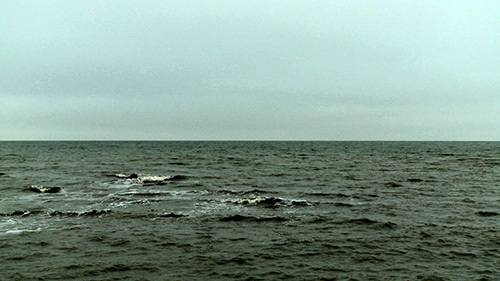 So we see the open sea in a variety of lights and weather conditions. The water is mill-pond still occasionally, but mostly it is lively, sometimes angry. Humans and vessels occasionally intrude: a red cargo ship, a tanker, an inflatable RIB, a dinghy, a lifeboat, a container vessel. Sometimes the tide is out and we get a view of the beach, sparcely populated by pedestrians. The soundtrack assists to put salt on your tongue: breakers, gulls, muffled voices, a lonely foghorn, that sort of thing. Towards the end we are given a split sequence featuring the sun setting which is cleverly and beautifully done. This is such a good installation, it transports you there. Almost. Horizon (Five Pounds a Belgian) by John Smith. Children’s Scooter from The Golden Tide by Gayle Chong Kwan. The opposite of these panoramic pieces is the micro, and a series of several dozen framed photos does exactly this: The Golden Tide by Gayle Chong Kwan. They are snapshots which the artist uploaded to Instagram over a period of time. 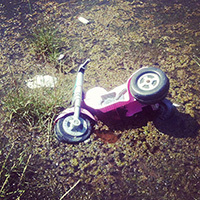 They feature people interacting with the estuary landscape through the means of human detritus: toys, plastic bottles, shopping trolleys (of course! ), tyres, wheels, wrappers, bits of broken glass, and so on. It works brilliantly. This excellent exhibition should take you about 45 minutes to an hour. If, like me, you haven’t been to Museum of London Docklands before, you’ll spend a further several hours enjoying fascinating displays about the history of our great river. I had high expectations of this museum: it effortlessly surpassed them. Estuary runs until 27 October. It is free, as is entry to the Museum.